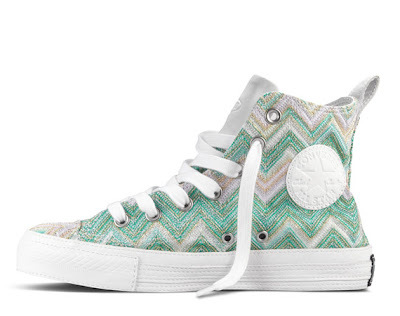 Il famoso Zig Zag di Missoni arriva direttamente sulle Converse All Star. 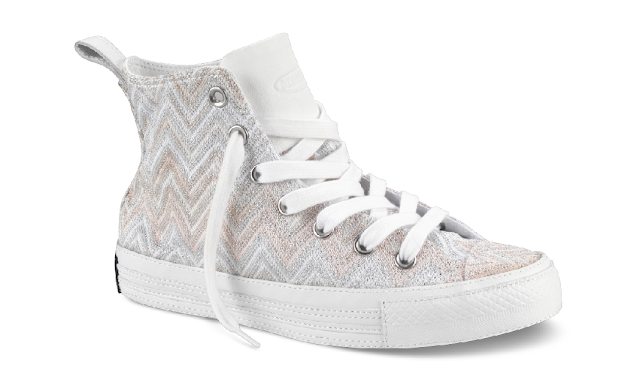 The famous knitted Zig Zag print by Missoni is on Converse too. Le collaborazioni tra grandissime Maison della Moda ed alcuni marchi Low Cost ormai sembrano davvero essere il futuro. Una moda veloce, fruibile, Limited Edition e che rende, seppur per un brevissimo periodo, i grandi marchi accessibili a tutti, diventando totalmente "democratici". 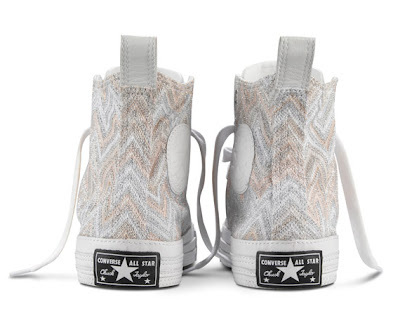 Il caso di oggi è quello della Maison italiana Missoni che collabora con il colosso americano delle Sneakers per eccellenza: le Converse. 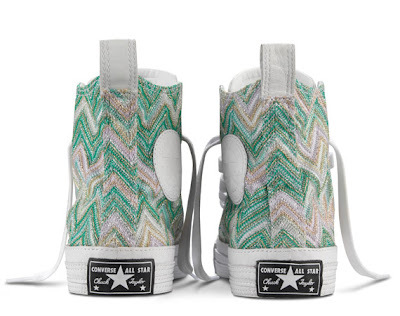 La collaborazione ebbe inizio nel 2010 e questa rappresenta la quinta Capsule Collection firmata Missoni per Converse. 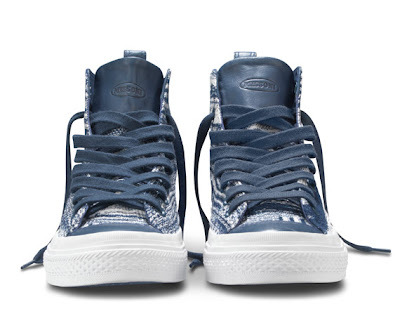 Il tutto si concentra sulla stampa diventata l'emblema del marchio stesso, ovvero il motivo a Zig Zag che incontra gli elementi base delle Converse come la suola in gomma bianca ed il classico modello alla caviglia (high top). Per la Capsule Collection P/E 2012 i marchi hanno deciso di creare 3 paia di scarpe, due riservate alle donne ed un paio Unisex. Le due paia con stampa a Zig Zag una col verde-turchese-oro e l'altra bianca-argento-oro sono i modelli femminili mentre quelle unisex sono color blu navy e bianco con il classico effetto "lavorato a maglia. 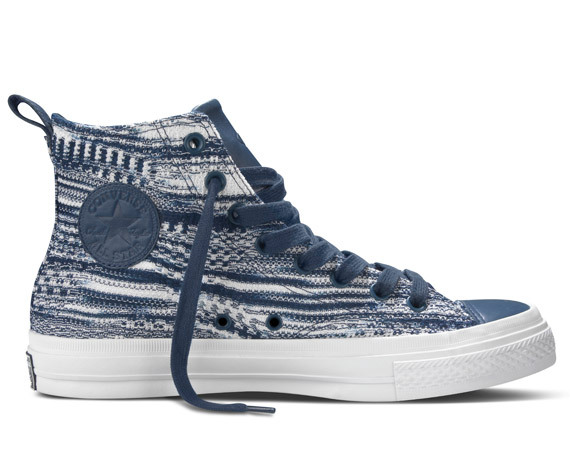 Le sneakers Missoni per Converse sono disponibili dal 14 Aprile in alcune boutique monomarca Missoni ma è possibile anche comprarle on-line sul sito ufficiale Converse ad un prezzo bloccato di $ 200,00. The collaborations between Fashion brand and some very big low cost brand seem to really be the future. A fast, usable and Limited Edition "Fashion" that also allow, for a short period, big brands to be accessible to all, becoming fully "democratic". 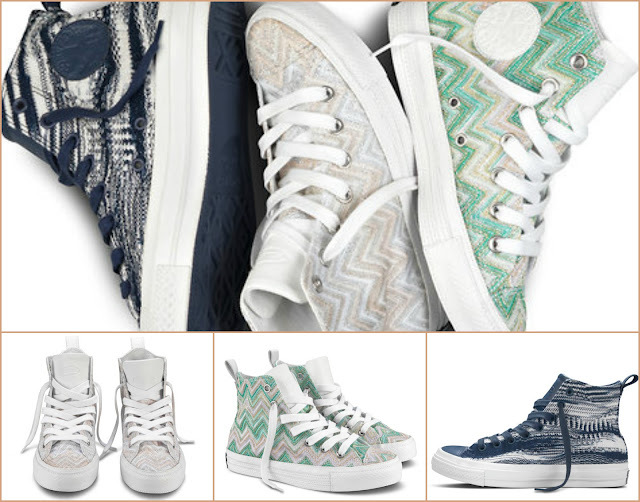 The Italian Fashion Brand Missoni works with the American giant,for excellence, of Sneakers: Converse. 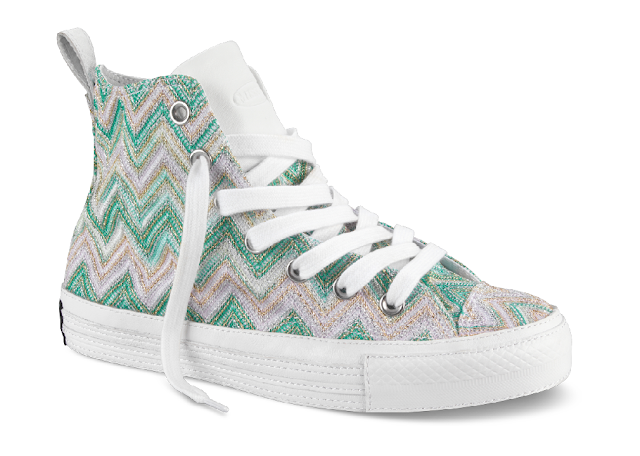 The collaboration began in 2010 and this represents the fifth Capsule Collection Missoni for Converse. 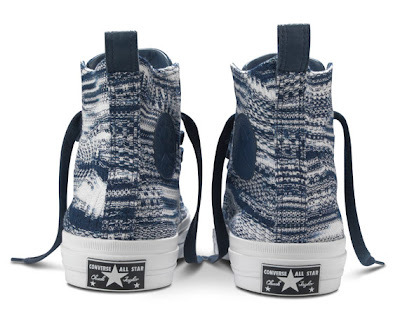 Everything is concentrated in the print became the emblem of the brand itself, Zig Zag print who meets the basic elements of Converse as a white rubber sole and the classic high top model. 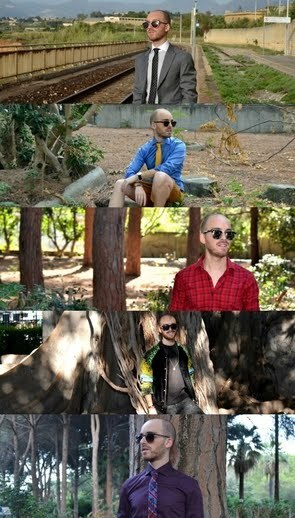 For the S/S 2012 Capsule Collection, the brands have decided to create 3 pairs of shoes, two reserved for women and an Unisex pair. 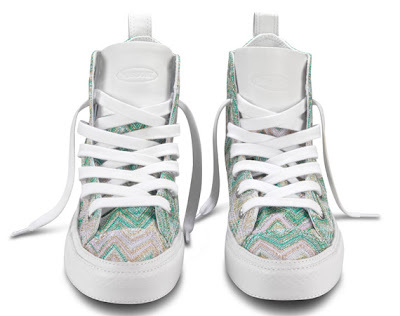 The two pairs with Zig Zag print with a turquoise-green-gold and other with white-silver-gold are the female models and the unisex one are in navy blue and white with the classic knitted theme. 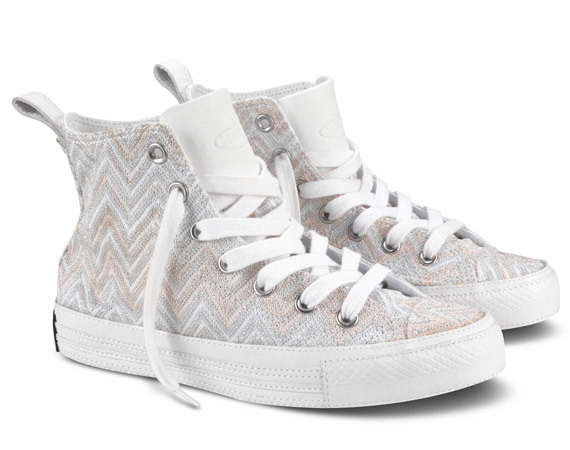 Missoni for Converse sneakers are available from April 14 in some Missoni boutique worldwide but you can also buy them on-line at Converse e-commerce at a fixed price of $ 200.00. Il modello più riuscito è sicuramente quello che ha le tonalità del verde. Gorgeous model is the one with green tones. Oh this is a lovely collection. No vabbè quelle verdi sono spettacolari!!!! I love Converse because I think it can practically go with everything. 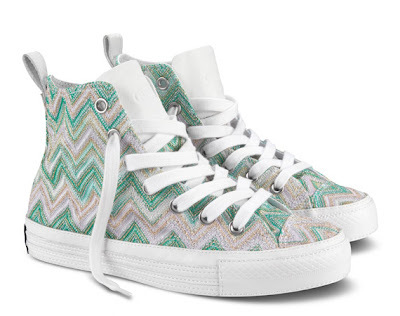 These Missoni ones are just incredible!!! Oh my goodness, these are gorgeous, so chic, I need to get a pair! 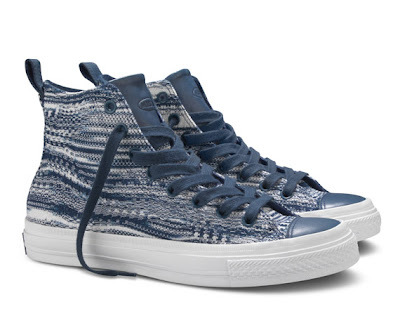 I had no idea that Missoni was teaming up with Converse! That is too fun. 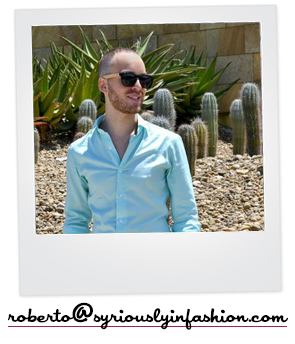 thank you for your comment on my blog, of course i'll follow you, too :-D lovely blog!! I love this collaboration with Missoni. So gorgeous and I definitely need a pair. missoni always kills it! another awesome collab. Mi piacciono davvero tutte!! 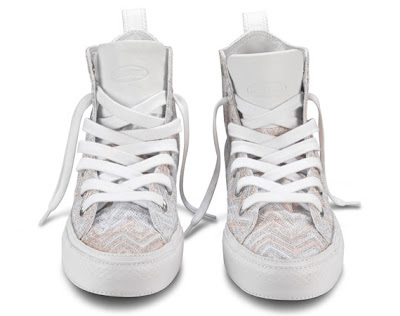 !poi io adoro le sneakers!!!! Che bella! Mi piacciono le scarpe!!! !